Long long ago, there lived an over-ambitious asura named Bhasmasura. He wanted to be the most powerful being of the three worlds and so went to perform severe 'tapas' i.e hard penance for getting the boon from Lord Shiva. He was determined and doing 'tapas', chanting Siva Panchakshari i.e. 'Om Namah Sivaya'. He was so engrossed that he completely got disconnected with the outside world. 'Om Namah Sivaya', 'Om Namah Sivaya', 'Om Namah Sivaya'. The power chanting traveled in the air and spread in all directions and finally reached Kailasam - the abode of Lord Shiva. 'Dhum-dhum-dha-dhum-dhum, dhum-dhum-dha-dhum-dhum! - the air in Siva Lokam (Kailasam) was filled with the rhythmic beat of damarukam as Lord Shiva was deeply engrossed in Tandavam (dance) along with His better half - Parvati Devi. They heard a strong voice chanting 'Om Namah Sivaya'. They stopped abruptly and wondered who is this great 'bhakta' (devotee). They peeped down and figured out Bhasmasura who was in deep meditation. Lord Shiva is well known as 'Bhola Shankara' i.e the innocent one. As per His nature, He knows no discrimination and is bound to grant boons to His true devotees, be it an asura (rakshasa) or a sura (devata). Instantly, He descended on to Earth and made His appearance in front of Bhasmasura. "Bhakta! (devotee) Open your eyes", said Lord Shiva. On hearing the Divine Voice, Bhasmasura opened his eyes and was over-joyed on seeing Lord Shiva. He bowed down to Lord Siva, fell at His Feet and said happily, "Maheswara, I'm blessed to see you. You are so generous to your devotees". There was a smile on Bhola Shankara. "You prayed for me, so I'm here to grant you a boon. What do you wish?" said Shankara. "Parameswara!, make me an immortal being", said Bhasmasura. "Bhakta!, this is against the law of nature. Ask for anything else except for being immortal." answered Shiva. There was much of pleading and refusal on this matter and finally Bhasmasura had to ask for some other boon. "What should I ask?" Bhasmasura thought deeply and finally came up with a new wish. "Maheswara", said Bhasmasura, "as I place my palm (hand) on anyone's head, one to burn down to ashes" wished the asura. Shiva got perplexed and thought "What a kind of wish is this?" Without thinking the consequences, Bhola Shankar granted the boon to Bhasmasura. "Ha, ha, ha! Ha, ha ha!" laughed Bhasmasura with joy and shouted, "Now, I have become the most powerful one. I can burn down anyone to ashes". "But how do I know", a sudden thought came in his mind. 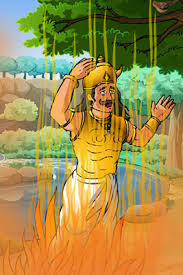 Bhasmasura wanted to test his power. "On whose head should I put my hand?" thought Bhasmasura. His wicked eyes fell on Bhola Shankara who was still standing there with an innocent face. "O!, Siva, let me place my hand on your head and test whether you will burn down to ashes or not" said Bhasmasura wickedly. Saying so, the wicked asura started running towards Lord Shiva with his hand stretched forward. "Oh no!, what a fool am I?" realized Lord Shiva and He started running for life. 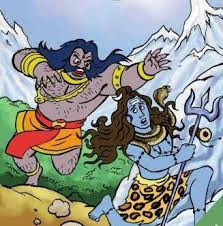 Bhasmasura started chasing Lord Shiva. Lord Shiva started running for His life and cried out for help, "Narayana, save me from this wicked asura", prayed Shiva and ran as fast as He could to hide himself behind the trees in the forest. Suddenly, a beautiful lady appeared in front of Bhasmasura who was awestruck with Her beauty and forgot about the boon that was granted to him. "Wow!, what a beauty?" said Bhasmasura to himself who was much attracted towards her and asked her, "O! beautiful lady, Who are you"? With a mesmerizing eyes, she said, "You have come to my house, it's not fair to ask me who am I? Instead, you have to tell me who you are?" "I am Bhasmasura". Please tell me yours", pleaded he. "I am Mohini", said the beautiful lady. Without a second thought, Bhasmasura asked Mohini, "O! beautiful lady, will you marry me?" "Ha, ha, ha", laughed Mohini. "You mean, marry you", said Mohini. "Then you have to defeat me in a dual dance", said Mohini. Bhasmasura had a question mark on his face. "Dance? But I don't know a,b,c of dance. How can I defeat you." Bhasmasura said with a worried face. "Don't worry, dear. I'm here to teach you. Just repeat the steps that I do and you are done." said Mohini with a loving voice. Bhasmasura couldn't believe it and jumped with joy. Being of demonic nature, he was so determine to marry the most beautiful lady that he completely forgot about his boon. He was too anxious to have her and he insisted her for instant dance class. Mohini started the steps rhythmically and Bhasmasura imitated each step of hers. Gradually he was doing better and better. Mohini increased the pace of her dance, so also did Bhasmasura. Taking the opportunity of the situation, Mohini danced round and round and round and placed her palm (hand) on Her Head. Bhasmasura who was too eager to have Mohini, without thinking, imitated the dance and placed his hand on his head. And lo! there were flames and his body was burnt down to ashes. Bhola Shankar, who was watching the entire drama from behind the trees, came out from his hide and felt greatly relieved. And lo! Mohini got transformed into Lord Vishnu - the Preserver who said, "Shankara, be careful before you grant a boon". Lest, you will be in trouble. And both the gods returned to their heavenly abodes.